This show knows how to open an episode. Although this episode ends up being my least favorite thus far, I enjoyed the beginning. Music is one thing that Cottonmouth and Luke have in common. It connects them. Both have intense focus when listening to music. I love the opening of this episode because Marvel makes this whole universe thing seem real. Trish ‘Patsy’ Walker is hosting her talk show, the same one she had during Jessica Jones season 1. Luke is outside running through the city listening to music while Trish is talking to the people of the city. Some like Luke, some don’t, but it was cool to see this connection between different shows. My main negative from this episode is Misty’s crooked partner, Scarfe. He was becoming interesting before he murdered Chico. In the last episode review, I neglected to talk about the weapons he stole from Cottonmouth. Well, he did it and of course our Harlem gangster ain’t too happy about it. They have a lame meeting where Scarfe lets Cottonmouth take his gun. 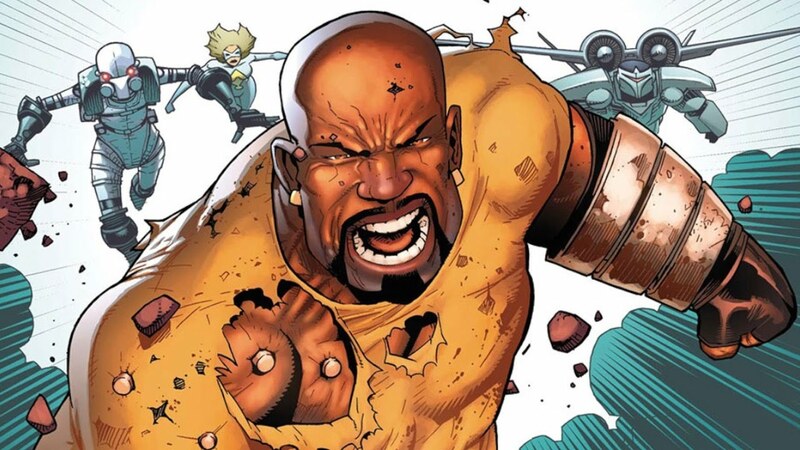 He wounds Scarfe and this becomes the focal point of the whole episode as Scarfe goes to none other than Luke Cage himself for help. Right after the shooting, there’s a cool moment with Luke and Bobby at a diner. Bobby is pushing for Luke to make a profit beating up bad guys (Hero for Hire.) Then, Claire shows up at the diner. If you don’t know how they know each other, please go watch Jessica Jones. I’m tired of people telling me they’ve watched Daredevil and Luke Cage, but not Jessica Jones. It’s a great show, it just isn’t full of hallway fight scenes. Anyways, Claire and Luke have some good dialogue before finding Scarfe at the barber shop. Claire proves how useful she is when she helps Scarfe by tending to his wounds. The reason this episode is bad to me is because of the focus on Scarfe and the attitude Misty has towards this whole thing. Her reaction to finding out her partner was crooked didn’t feel authentic at all. You want to justify him being a murderer because what, he helped you in the academy? Scarfe has a nonchalant attitude too. Claiming he isn’t such a bad guy and that others are far worse. No, Chico wasn’t a bad guy. He didn’t deserve what happened to him and Scarfe is the reason people in real life don’t want to speak up. I was really hoping Chico would turn into a side character who helped Luke throughout the show. So, Luke, Claire, and Scarfe head out on a wild goose chase through the city, trying to get Scarfe to the hospital. They have to keep him alive so he can testify against Cottonmouth. The chase is fun, but the best part of this episode was seeing Misty use her brain to get Lieutenant Perez, an officer who was helping her look for Scarfe, confess. She pretends to answer her phone and says it was Scarfe who called her, telling her not to trust Perez. He falls right into the trap, confessing his part in the corruption. It was satisfying to see Misty have such a cool moment like that. Scarfe ends up dying. The scene was a bit laughable because of the character development of the crooked killer. Still, Luke obtained a ledger from Scarfe with notes on Cottonmouth’s crimes. He is arrested at the end of the episode. The music that plays as they cuff him is perfect. Luke and Claire have incredible chemistry too. Their moment at the very end genuinely made me laugh. Rosario Dawson is a great actor. A solid end to the worst episode yet. PS- Mariah’s development in this show has been slow and almost invisible, but it’s there. I love the journey her character is going on right now as a phony black politician, hungry for more power. Interesting to see if she sticks by Cottonmouth during his time of turmoil.